The epic conflict between the galactic empire and the rebel alliance. Fantasy Flight finally brings us the big Star Wars game we were expecting, and for the most part it’s a satisfying, very assymetrical, epic game with a big emphasis on the personalities of that galaxy far, far away. The Imperials are powerful and threatening, and those plastic death stars really do terrify as they move slowly from system to system. The Rebels are outgunned and it can be discouraging to play them at first, but they can send diplomatic missions to planets to gain their loyalty, and nibble away at the Empire’s strength with sneaky missions. All the while the Rebels are trying to keep their base hidden from the bad guys. 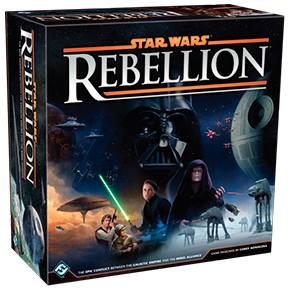 The combat system is strangely clunky and unsatisfying and the box is ridiculously large for the contents, but if you have even an iota of love for Star Wars and would enjoy a good long and involving boardgame set in its universe, you’ll enjoy Star Wars: Rebellion. And the big bag of gorgeous little plastic miniatures included is a fan’s delight. The reference itself looks great; thanks for this. I do have a graphic-design question, though. The orange and black banner headers (“Setup”, “Game Round”, “1 Assignment Phase”, etc.) display in what looks like a regular gothic typeface when I view the summary/reference PDF in Chrome, but in Adobe Acrobat they show up as fat Adobe Sans MM and the letters appear all jumbled together. In neither client do they look like the “SF Distant Galaxy” (http://www.dafont.com/sf-distant-galaxy.font) typeface. Is that font not embedding properly? Damn, I turned off the font and it displayed OK, so I thought it was fine. I’ll have to substitute a different font. Font error fixed. Unfortunately the supposedly free font doesn’t embed into a PDF properly, so I used another one. My girlfriend and I played our first game last night using the v1 reference, which was hugely helpful. Much appreciated. I find your summary even more vital than usual for this game. The dual rulebook format is good for learning the game and looking up detailed specifics, but neither book is great for quick reference while playing the game. This game has an unusual structure, and your layout makes the whole thing much easier to follow. Excellent as always, Peter! Aaaaaarggghhhh!!!! Printed out the rules summary yesterday and you updated it today! Played this for the first time today. Took us 4.5 hrs as we were learning as we went. Sadly the empire (me) lost when time ran out. I was one turn from obliterating the rebel scum with one of my death stars. Now that FFG (among other things) unfucked the clunky combat mechanics with the Rise of the Empire expansion, will we we an update to this? Yes. I almost bought it this weekend but someone grabbed the one copy in the store before me! But you hated the Rogue One movie…. Yep, I did. And actually I haven’t enjoyed this game yet either! But I’m hoping the expansion, and a bit of persistence, will improve this particular game experience. If not I’ll sell the lot. Played it a couple of times and it’s not a quick game. I have the expansion and will play again when I get chance, but now my 6 weekly games day is knackered due to the friend I gamed with never having the same day off… our rotation does not match. Love the reference but I think I found an error. As far as can tell from the expansion rules, you should be able to remove damage from previous round with the proper dice side as long as the ship has yet to leave the board. Thanks, will update. This combat system modification does my head in!